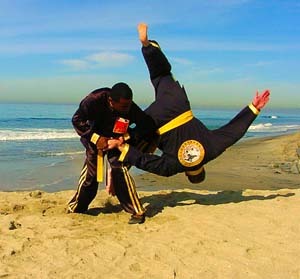 In Hap Ki Do, movements are hard and soft. Target areas are the joints, pressure points, and nerves. Close proximity to the opponent is most beneficial. Hands and feet are equally used in offensive and defensive movements. Strikes are in all directions, and are mostly angles rather than circles. Similarly, in Ai Ki Do, movements are hard and soft, and the target areas are the joints, pressure points, and nerves. However, hands are usually used more than feet. Offensive and defensive movements are applied in all different directions, angles and curves, and a very strong handgrip is used.